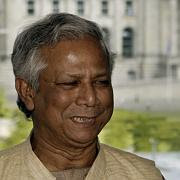 No need to say how much I admire Nobel Peace Prize winner Muhammad Yunus. In this great article he explains his few on leveraging globalization and social business to make a difference in the world and to alleviate poverty. Globalization: "I support globalization and believe it can bring more benefits to the poor than any alternative. But it must be the right kind of globalization. To me, globalization is like a 100-lane highway criss-crossing the world. If it is a free-for-all highway, its lanes will be taken over by the giant trucks from powerful economies - Bangladeshi rickshaws will be thrown off the highway. In order to have a win-win globalization, we must have traffic rules, traffic police, and a traffic authority for this global highway. The rule of 'strongest takes it all' must be replaced by rules that ensure that the poorest have a place and piece of the action, without being elbowed out by the strong." Social Business: "Will be a new kind of business introduced in the market place with the objective of making a difference to the world. Investors in a social business could get back their investment money, but will not take any dividend from the company. Profit would be ploughed back into the company to expand its outreach and improve the quality of its product or service. A social business will be a non-loss, non-dividend company." Read the inspiring SPIEGEL ONLINE article.